Starting a new tab, we are going to get into another brew from one of my favorite craft brewery from Portland, Or. 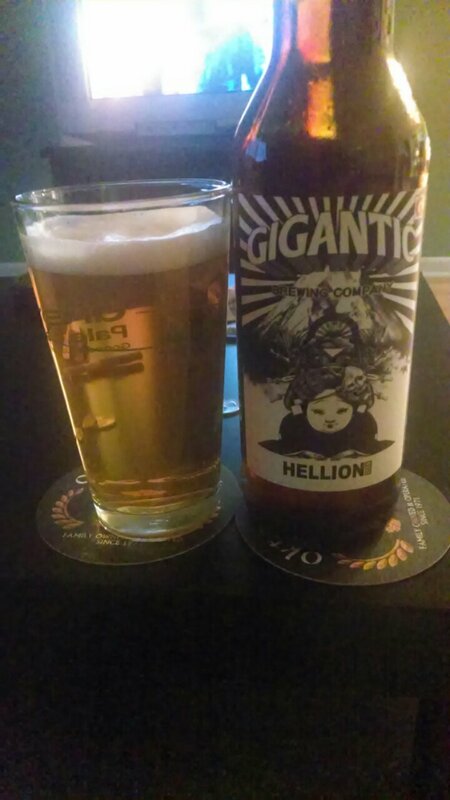 I am talking about Gigantic Brewing and their Hellion. If you read my earlier beer blog on this brewery, you know the history of this little brewpub. If you have not, please, read those beer blog posts to get to know this great craft brewery. Let us get into the beer. It has a clear golden color with a constant white head on this brew. The smell is a sweet Belgian notes. It has a farmhouse smell notes. The taste is citrus notes of spices with a crisp dry hop finish. It is pretty drinkable beer. To some a Hellion is a troublemaker, to others a messiah. Our dry-hopped Belgian-style golden ale will bring out one or both in you. Which will it be? Notes: Dry-hopped with Sorachi Ace and Simcoe = lemon, grapefruit and dill aromas. Complex aroma and flavor of ester and spice from a Belgian yeast strain. Availability: July-October 2013 in Oregon, Washington, California, British Columbia, Alaska, Vermont and Chicago.